Typical clients of Mr. Rodriguez are banks, lenders, commercial creditors, landlords and D&O defendants. Mr. Rodriguez’ focus and experience is in asserting the rights of his clients in complex bankruptcy cases, commercial litigation, collection, D&O defense, and pre-bankruptcy and litigation preparation. A debtor’s bankruptcy filing presents immediate and complex issues to any creditor or interest holder. When a bankruptcy case is filed, prompt and thoughtful action is required to protect rights in the often unpredictable arena of bankruptcy courts. Mr. Rodriguez has represented clients in a range of bankruptcy matters in courts across the United States. His representations often include cash collateral disputes, dismissal and conversations, motions to lift stay, plan confirmation fights, sales free and clear (known as 363 sales) and proof of claim filing and objection defense. Additionally, Mr. Rodriguez represents clients in bankruptcy-specific litigation known as adversary proceedings. Mr. Rodriguez has defended lender liability claims, defended preference recovery claims, complex lien contests, prosecuted dischargeability lawsuits and defended trade secrets, among other matters. Sometimes litigation is unavoidable. When it is, calculated and aggressive representation can make a positive impact on protecting the rights of clients in the dispute. 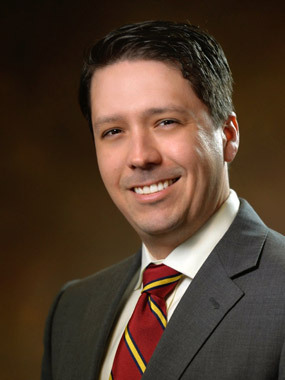 Mr. Rodriguez has represented clients in State and Federal Court in litigating lender liability defense, commercial contract disputes, real estate transaction disputes and lien avoidance defense. Mr. Rodriguez prosecutes debt collection suits as part of his litigation practice. However, most creditors know that simply obtaining a judgment does not mean the judgment will be paid. Mr. Rodriguez represents lenders in all stages of collection, beginning with initial demand and negotiations through to litigation and post-litigation collection. Additionally, Mr. Rodriguez provides support for real property foreclosure and personal property sales. As a part of his collection practice, Mr. Rodriguez represents lenders in seeking receiverships, defending injunctions, and protecting the lender’s rights in receivership cases filed by adverse parties or governmental agencies. Defending an officer or director from liability often requires an understanding of corporate governance issues as well as very fact intensive analysis of the actions of multiple parties. To assist an officer or director, a thorough understanding of the background as well as work with an insurance carrier is a must. Mr. Rodriguez represents officers and directors in defense of D&O liability claims. Mr. Rodriguez has represented D&O defendants in complex cases in which multiple D&O have been sued. Mr. Rodriguez’ clients can expect a comprehensive analysis of the issues and background as well as strategies created to each individual situation. In addition to Mr. Rodriguez’ practice areas, he is often called into various other matters in the Firm to assist in pre-bankruptcy and pre-litigation matters with the aim of avoiding litigation in any venue. The industries and representations that Mr. Rodriguez has advised in pre-bankruptcy or pre-litigation are extremely broad and include commercial, industrial, real estate, banking, and consumer matters. Introduction to Bankruptcy Considerations for Oil and Gas Lawyers,, Texas Wesleyan Law Review, Fall 2009, Vol. 16, p. 93. Mr. Rodriguez represented a large institutional creditor in connection with collection and subsequent bankruptcy of its multi-family borrower in El Paso, Texas. Mr. Rodriguez represented a large institutional lender asserting its junior lien on a Houston area multi-family complex in bankruptcy Court. Mr. Rodriguez represented an international investment company in a civil collection lawsuit against international defendants in Houston State Court. Mr. Rodriguez represented a large institutional investor in protecting its secured claim in a Chicago bankruptcy case. Mr. Rodriguez defended corporate clients in Delaware and New York from preference claims. Mr. Rodriguez represented a real estate investment company in the acquisition of various properties and assets out of bankruptcy in Dallas and surrounding cities. Mr. Rodriguez represented a national bank in connection with defending the bank’s lien against multiple parties challenging the lien position of the bank in state and federal court in Dallas. Mr. Rodriguez represented a local bank in guarantor collection and negotiations as well as real property foreclosures and personal property sales and auctions in Dallas and Houston. Mr. Rodriguez represented a regional bank against a lien challenge and lender liability claim that was tried in multiple federal and state jurisdictions in Dallas and Fort Worth. Mr. Rodriguez has represented a national bank in asserting its interest in a large SEC receivership case in Utah. Mr. Rodriguez has represented a large institutional lender in defending a receivership action in California. Mr. Rodriguez represented an officer in connection with defending the officer from D&O liability after the company failed.